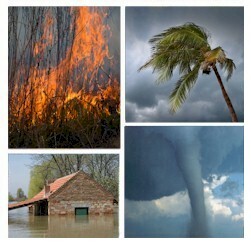 Disaster Communications and 911 Emergency Alert and Notification Articles for Emergency Alerts and Community Warnings. To prepare for the worst, Richard Taylor has a backup generator, a two-week supply of water and food, and detailed plans on how to reach his wife and five children, ages 6 to 17, throughout a disaster. The goal is to get them to a central place so we can account for everybody and make them safe," says Taylor, an executive recruiter in Stamford, Conn., whose preparations were inspired partly by volunteer work with the Boy Scouts. ''It's the world we live in." What's your first concern if terrorists attack, a hurricane strikes, or the power grid fails? Besides protecting your life and limb, your priority undoubtedly is getting in touch and reuniting with family. Yet in an emergency, especially on a weekday, contacting spouses and children at workplaces and schools could be tough. Telecommunications likely will be jammed. Transport may be halted. Red Cross surveys as recent as a year ago show that though most Americans say they're prepared, only a third have any kind of family emergency plan. A little preparation could save heartache and even lives. Plan ahead: First, choose two meeting spots, one outside the house in case you're all home and there's a fire or other close threat, and one at a relative's or friend's place where you could spend several days. Then choose an out-of-town contact person to relay messages, since analysts say long-distance calls often work better than local service in a disaster. This is a common strategy for people in global hot spots, says Rona Fields, a George Washington University researcher. Check work/school plans: Ask about disaster plans at your workplace, child's school, or elderly parent's nursing home. More than half of school-based police officers say their site's crisis plans are inadequate, according to a survey by National School Safety and Security Services, a private Cleveland firm. After Sept. 11, 2001, Watertown-based child-care chain Bright Horizons Family Solutions set up a toll-free hotline so that parents can get news in an emergency, perhaps before center staff can reach them. When pipe bombs were found in a teen's car near a Bright Horizons center in Apex, N.C., on Aug. 9, parents called the hotline and learned that the center's 80 children, from infants to age 6, had been evacuated to a local library. Learn to text message: No technology is infallible, so keep your options open. Although cellphones depend on switching centers and antennas on the ground, carriers now have mobile transmitters, called ''cells on wheels" or COWs, for quick backup. Several carriers also have agreed to give emergency personnel priority on networks during disasters. Still, wireless lines are likely to get jammed, now that an estimated 60 percent of Americans own cellphones. Instead, try a text message. Calls get dropped if lines are busy, but text messages wait for eventual relay. Portable e-mail on phones and handhelds may come in handy. New location-based services, such as ULocate or AT&T's Find Friends, can't always pinpoint people's whereabouts, analysts say. Having several technologies at hand will boost your chances of staying in touch. Still, communications will probably be a free-for-all, with every speed-dialer for himself in an emergency. That's why homeland security specialist W. David Stephenson is lobbying the government to use wired citizen-volunteers to relay information. The bottom line is, people are going to use communications in a disaster," says Stephenson, of Medfield. ''The choice is whether people using the devices are going to just consume all the bandwidth out of fear, or do it intelligently and assist in a response." Maggie Jackson's Balancing Acts column appears every other week. She can be reached at maggie.jackson@att.net.